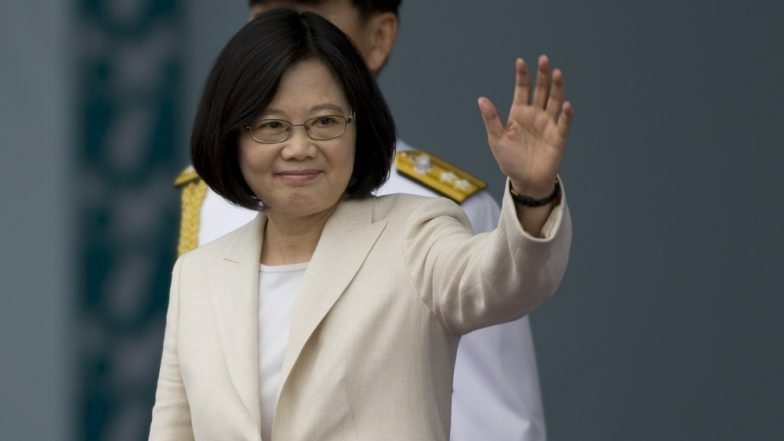 Washington, April 9: Taiwan's President Tsai Ing-wen on Tuesday pitched a trade deal with the United States, saying it would both safeguard the island's security and address US concerns over China's growing control over fifth-generation communications. Addressing a think-tank forum in Washington by video, Tsai said the US and Taiwanese economies were "complementary" and that a trade pact could provide a model for the Indo-Pacific region. China, which considers Taiwan a province awaiting reunification, has long opposed international agreements involving the self-ruling democracy but poured in investment and tourists under Tsai's Beijing-friendly predecessor, Ma Ying-jeou. "Taiwan's economic diversification is related to whether we can remain a free and open society," said Tsai, who emphasises the island's unique identity and has seen growing friction with Beijing. Xi Jinping Says China Will Continue Use of 'Military Force' to Ensure Taiwan's Territorial Control. "China's influence campaigns are undertaken using economic actors. By aligning ourselves with the United States and other free-market actors, we can reduce our economic reliance on China and their capacity to interfere in our media, politics and security," Tsai told the forum at the Center for Strategic and International Studies. She said a trade deal was "particularly relevant" amid worries over Chinese telecom giant Huawei and "the scramble for control over the future of 5G networks." "We need to shape the flow of this supply chain so that critical technologies, infrastructure and assets do not fall into the wrong hands," she said. The United States has been pressing for countries to avoid Huawei as they build their next-generation networks. US Secretary of State Mike Pompeo says Huawei presents security and privacy concerns, but his campaign has had limited success with critics saying Washington is seeking to preserve market dominance. The United States recognises only Beijing but, under the 40-year-old Taiwan Relations Act, is required to provide the island with the means to defend itself. With Taiwan enjoying wide support in the US Congress, several lawmakers have called for a free trade agreement with the island. But the two sides face a raft of trade disputes, notably US objections to Taiwan's ban on pork and beef with traces of ractopamine -- a feed additive to boost animals' growth that is widely used in the United States but banned in the European Union. President Donald Trump has been critical of free-trade agreements, but Tsai voiced hope, saying his administration "has shown the capacity to be creative when it comes to trade."